At Barcade we feel a responsibility to reduce the environmental impact of our business. Here are some of the products we use and programs we have implemented to help reduce our footprint. Local beer tastes best. Barcade only sells American-brewed craft beer, and only beer on draft. On average, 75% of the beer served will be brewed within a few hours drive. 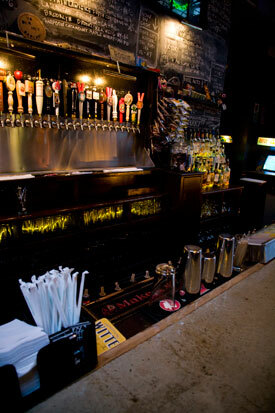 By not serving bottles and cans, the draft beer moves quickly and beers are rotated more frequently. Empty kegs are returned to the breweries for cleaning and re-filling with no waste or energy consumed by recycling glass or aluminum. Barcade runs off of wind power provided by local wind farms. The power is delivered to us through the grid by an alternative energy provider. These days a “Made in America” tag can be refreshing to see. Most of our shirts are American Apparel brand and are locally screenprinted by Kayrock Screenprinting. Our winter beanies are made of recycled fibers from Jimtex. Much of the material used during our construction was salvaged or found. Whenever possible we have used reclaimed wood, doors, windows, light fixtures and just about everything else. Recycled paper stock is used for our daily beer menus.